There are so many levels in learning and mastering the alphabet. Noah is now very good at singing the ABC song, knows all of his uppercase letters, and can write almost every single letter (uppercase) without any help. Since he's doing really well with those concepts, I thought it would be a good time to work on his lowercase letters. He's really good at recognizing the ones that look like the uppercase letters, but b & d and n & h often confuse him. So I was really happy when I found this post and free printable on Pinterest. Seriously, go check out her website... it's full of amazing ideas and resources! It's just an added bonus that it was apple themed. It worked out really well considering we went to the apple orchard this past weekend and enjoyed some apple recipes this week! 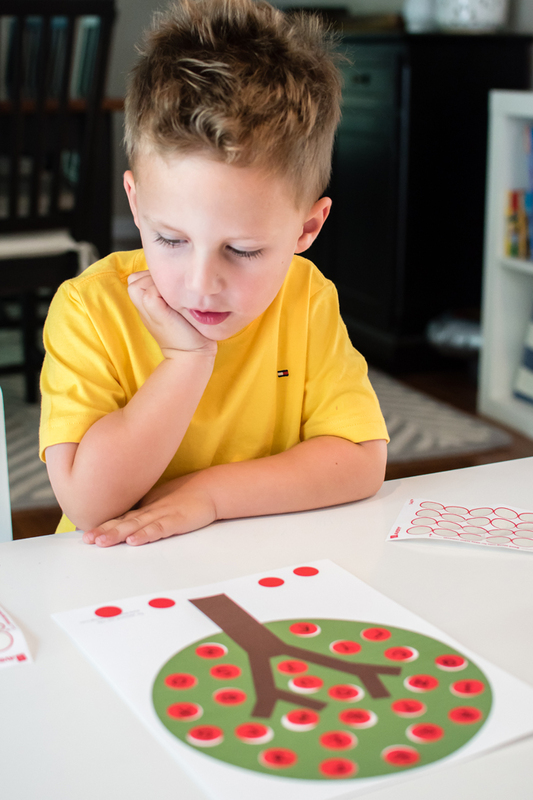 One afternoon, I gave Noah the apple tree printable and the stickers, and he got to work (giraffe had to help too, of course!). 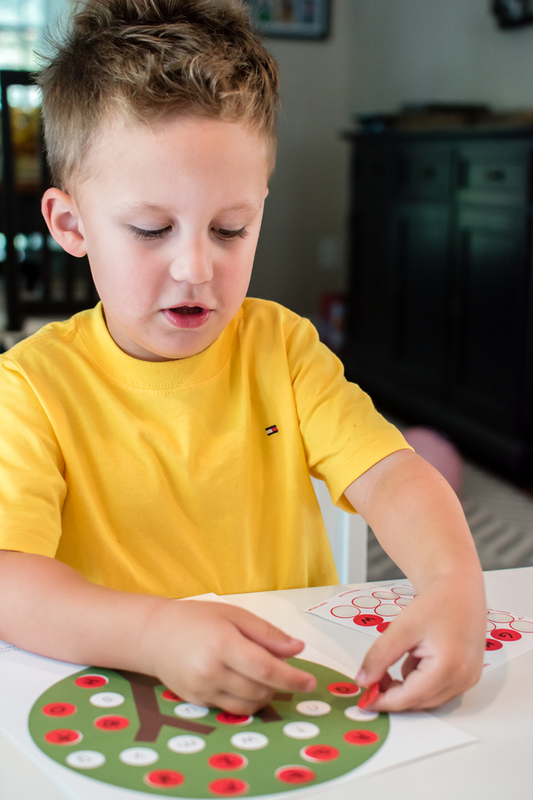 Noah loves stickers, so this activity was right up his alley. 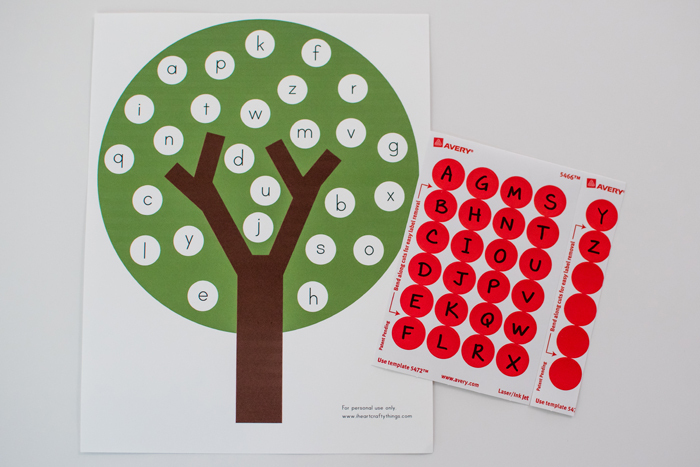 I didn't give him much guidance other than telling him to match the uppercase letters (on the stickers) to the lowercase letters (on the tree). All on his own, he decided to do the letters that he knew well first and then work on the ones that he wasn't so sure with. I did help him a little when he got really stuck or needed confirmation before putting the sticker on. While it was a fairly quick activity, considering that there wasn't much prep time involved, I really loved it! And anything that is learning disguised as fun is good in my books! 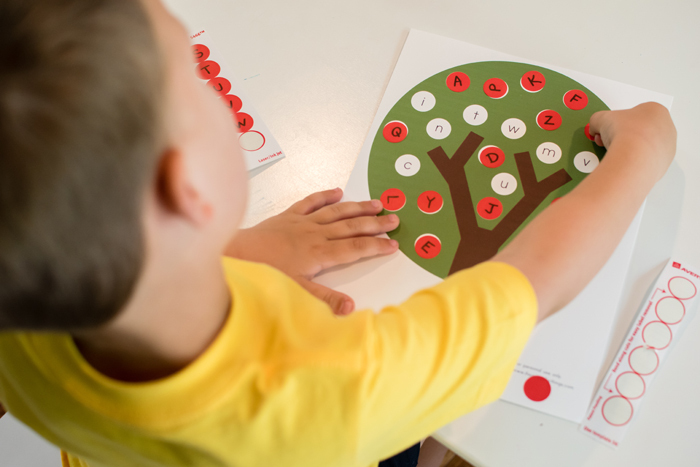 What methods have you found helped your kids learn their letters, big and small? Thanks for sharing! Cash also gets confused with d, b & p, too. I love this activity. We've done this with different themes before and it's fun. I love seeing Cam learn and have fun. Makes it easier. Ha ha! 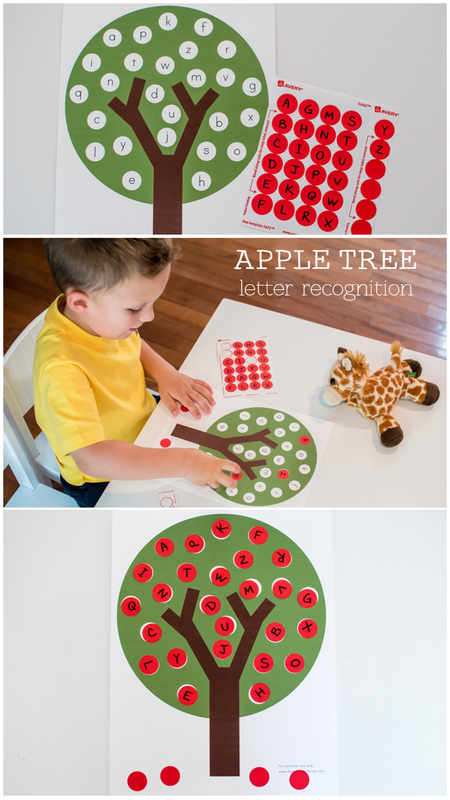 That is such a cute and easy way to help them learn and how perfect with you apple orchard trip too! I bought some puzzle pairs at Target with "mama and baby" letters for my girls when they were his age. They may still have something similar! Consider this done in our house. 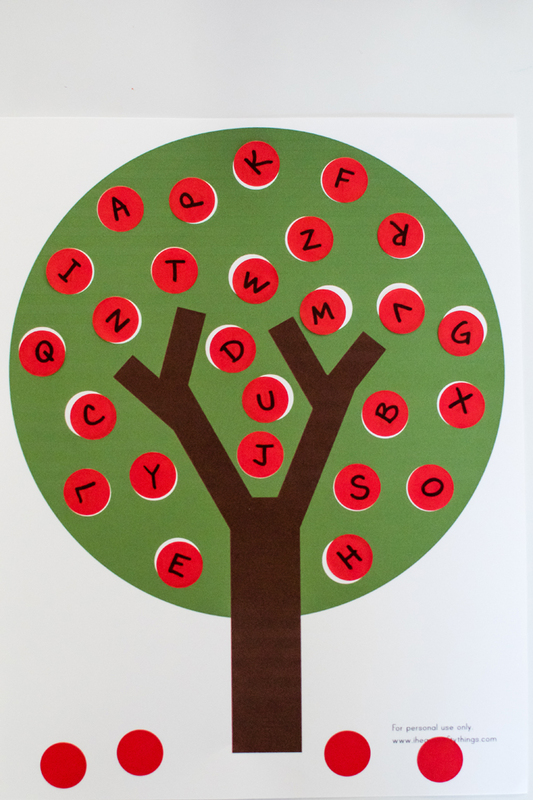 I struggle with finding activities to help Connor learn upper and lowercase and this is perfect. Maybe we can do it while our apple pie bakes. 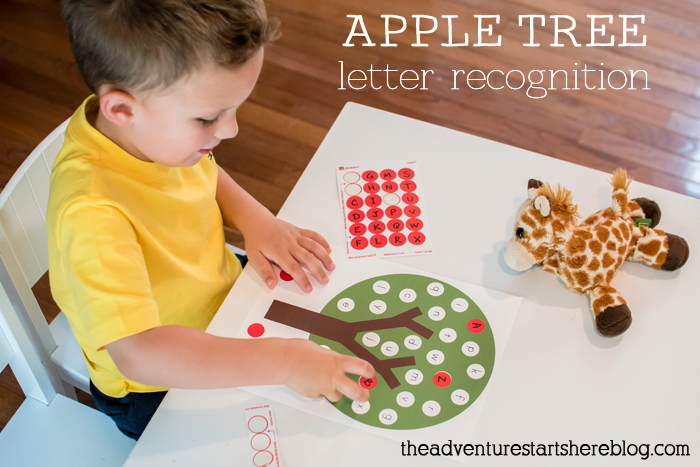 I love apple tree activities in general, and this one is a great idea! What a great craft idea!!! I would have never thought of that. 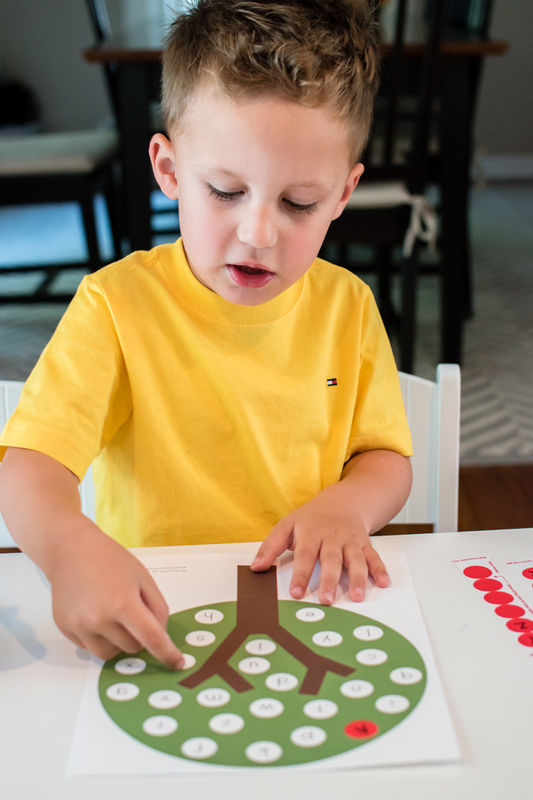 I love that it makes it fun by incorporating the stickers but is also educational! What a great craft! You are so creative with things like this. And Noah is as cute as ever!